In this episode of the RV Podcast we’ll talk to an expert on how to fulltime RV on $1,500 a month, even less if you follow some of the tips you’ll hear on our interview of the week segment…coming up. Also in this episode, lots of practical, how-to RV tips and advice, your questions and our answers, RV news of the week and an off the beaten path report for your RV travels. We’re still down on the beautiful Emerald Coast of Florida’s panhandle and because we’ve heard from a number of you who would like to meet us, we’re going to try something – a meet and greet afternoon next Sunday, October 22. We’re going to meet on Navarre Beach, at the entrance of the Gulf Islands National Seashore. Now because of the recent Hurricane Nate, the national seashore drive is closed just west of Navarre Beach. But the meet spot we picked is just to the left, or east of the bridge leading from Highway 98 and the mainland to Navarre Beach. Jennifer and I will be there from 2PM on and whoever shows up, shows up. Bring some beach chairs and refreshments and we’ll hang out for the afternoon on one of the most beautiful beaches in the country. Just look for our 2017 Roadtrek CS Adventurous XL 4X4 and come by and say hello. If there are any updates it, we’ll post a notice on our Roadtreking Facebook Group and Our Roadtreking Facebook Page so check there for the latest. We’re really excited about the phenomenal growth of our YouTube RV Lifestyle Channel. We are now getting almost 1 million video views EACH month. We continue to put two videos up each week, as well as regular live reports, and we thank you for subscribing to the channel. One of the reasons we so enjoy doing meet and greets like the one we’re planning for Florida this week, or attending RV gatherings and rallies around the country is the opportunity it presents to pick up valuable suggestions and tips from other RVers. In North Carolina a couple of weeks ago, we met the Emby family, who shared with us how they pack and organize for RV trips using Ikea bags. Thanks Embry family! We will definitely pick up some of those Ikea bags. And for all of you listening today, be sure to send me your tips and suggestions for the RV lifestyle. You can use the “Leave Voicemail” link at Roadtreking.com. Just click it and then use the built-in microphone on your computer or mobile devise to record a message to me. You can do it over as many times as you want, until you are satisfied. And then you just click a button and it comes right to my email inbox. How’d you like to quit your job and fulltime in your RV? Or maybe you’ve retired and just have social security to live on. Is that enough to live a fulltime life in your RV on the road? Our guest this week in our interview segment is Jerry Minchey, a frugal expert who says yes…it is. But first, Jerry says, before you quit that job or sell the house, you better count the cost. Literally…and figuratively! Jerry Minchey is the author of several books about the RVing lifestyle and retirement living. He lives full time in his 34-foot Class A motorhome. He has a Bachelors degree in Electrical Engineering, an MBA from the University of Suth Carolina, and management degree from Harvard Business School. He has worked for NASA and worked for many years as a computer design engineer. He holds five patents, and has a private pilot license. He is the founder and editor of the website, LifeRV.com. For many teens, getting your driver’s license is a time for celebration. However for parents, it can lead to clock-watching and worrying. And for good reason: according to the National Safety Council, nearly half of all teens are likely to be involved in a car crash before graduating from high school. This week is National Teen Driver Safety Week (NTDSW) – a great time to strike up a conversation on this important topic. Set rules and expectations with your teen driver. A parent-teen agreement is ideal for outlining rules, privileges and consequences for both parties. Restrict driving with young passengers. A single young passenger can increase a teen driver's fatal crash risk by 44%. Practice with your teen for at least 30 minutes each week. Become a role model for your teen. Let them know it's OK to put the phone away or disconnect from in-car infotainment systems and drive distraction free. We see a lot of folks with the North America map on the side of the RV, and we’ve visited with friends and acquaintances at camping get-togethers enough to know that making collections of travel memorabilia is a common pastime. We ourselves collect national park magnets (only from parks in which we’ve actually camped) to put on the front of the fridge at our stick and bricks house. They remind us both of where we’ve been, and of the fact it’s soon time to get out on the road again. Better than that, though, we’ve come across a few collectibles that are more intangible in the hand but sharper in the mind. 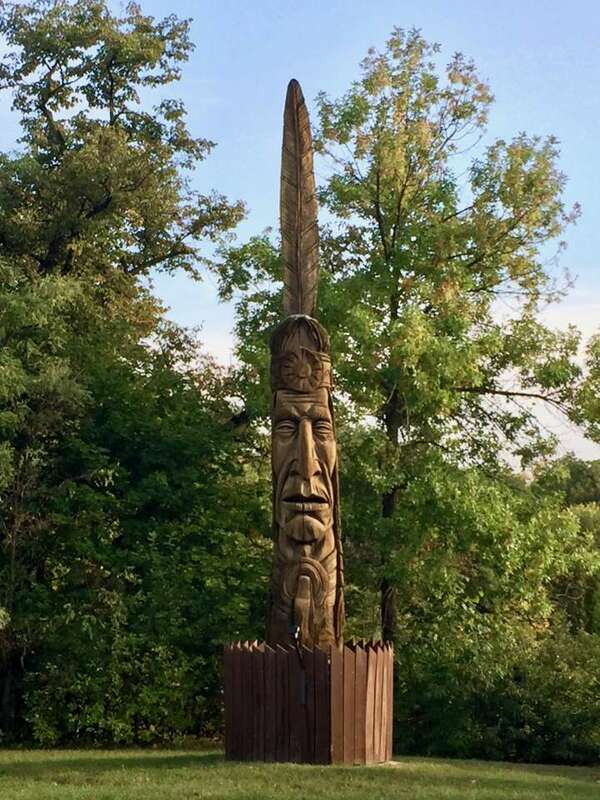 One of the latter recently saw us in Iowa Falls, Iowa at sunrise to capture a few photos of a tall wooden sculpture on the bluffs overlooking the river. Peter “Wolf” Toth was born in Hungary and emigrated to the United States as a young man. He settled in Akron, Ohio and received an art degree from Akron University. He completed his first Whispering Giants sculpture in 1972, carved into the stone of a cliff overlooking La Jolla, California. Toth studied and admired the Native Americans, both for their devotion to the Earth and for their tenacity. Wishing to honor and bring attention to their mis-treatment, he chose to make them the focus of his lifetime work. After selecting a location, he secures a native log or standing tree about ten feet in diameter. He next spends time with the Native Americans of the area, learning from them about their history and lore, and looking at historic and contemporary photos and paintings. Sometimes it’s agreed he’ll carve the likeness of a specific historical figure, like Chief Grey Lock, who can be seen in Burlington, Vermont. More often, Toth visualizes a face that incorporates the lines and features of many individuals. Says he, “I look at the log until I can see the Indian inside it, then I start carving. His work is mostly done with hammer and chisel, and takes two to three months to complete. The town provides him room and board, and he donates the completed sculpture in return. There are seventy-four sculptures in the series, with at least one in each of the fifty states, and in several Canadian provinces. We’ve had the pleasure of seeing several, and gladly drive out of the way to collect another. Most recently we communed with heads in Paducah, Kentucky and Red Lodge, Montana, as well as the one in Iowa Falls. Toth lives in Florida and creates small sculptures for sale, the proceeds from which support his ongoing work on the Whispering Giants. In addition to creating new pieces, he restores and repairs earlier pieces that need attention. Pick something that interests or intrigues you – giant balls of twine, ethnic pastries, esoteric breeds of cattle, regional dance styles, accents and dialects, or local folktales. Let it guide your travel, if just a bit. Gather some stories and tell them here. We’d love to hear them. Meanwhile, you just might run across us, Patti & Tom Burkett, somewhere off the beaten path.